The Bone Deformer allows you to create a basic or advanced skeleton structure in which the parent deformer will move the child deformers. The Bone Deformer is mostly used when animating the extremities of a character, such as the arms or legs, and will add fluidity and a natural feel to the animation. The Bone effect can be manipulated to rotate a limb at an articulation joint and to shorten or elongate the extremities of a limb. Every Bone module within a skeleton chain is linked by an Articulation module. The Curve Deformer has a hierarchy similar to that of the Bones Deformer and provides you with complete flexibility. 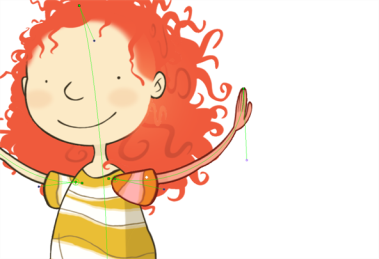 For example, when editing curves, you can deform a straight line into an arc or a zigzag with only a few clicks. Curve Deformers are mostly used to animate elements that do not have joints, such as hair or facial features. 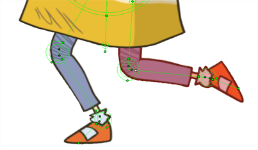 However, in some cases they can be used to animate limbs to create a specific animation genre, similar to the early rubber hose style of animation with typically simple, flowing curves without articulation (no hinged wrists or elbows).